Badger wakes up at the Crimson Harpy, to find that two Eidolorn privates have been dispatched to fetch him back to the Keep. He makes them wait for a while so he can get a final answer from Hayley Hosspotch on the brothel he wishes to set up. The halfling shows up and confirms the Hosspotch support for the venture. Solveig and Baro wake up to a far different situation, a panic within the Armory Square in Floivin Keep. A bizarre, anomalous vortex of blood has manifest within the center of the military district, and it seems to be doing nothing but spin and drip. The Last Eidolorn look on in awe. Gruulsh is fetched at the southern pass west of the Keep by a pathetically disguised Private Jolson, and Ballyhoo wakes up in a heavily occupied suite at the Seven Floods Inn. He hears a commotion downstairs about the missing serving boy, Brand. Eventually, all six of the PCs are assembled at Armory Square, with Hoary, Mistlethroe, and eventually Schnoo the Sorcerous, who is summoned to attempt to dispel or destroy this unknown, horrific manifestation. The attempt fails, but it triggers a response, as the small tornado transforms into the visage of Kra'alt Zuult, emissary of Sothos Karr and high priest of Gruumsh. Zuult tells the gathering in no kindness that Dror Gheel, the Slavemaster, desires satisfaction for the offenses of the Champions of Floivin Keep at both the town of Badash and the Mimresh fortress, both of which he considers to be breaches of the 'truce' that was made between Zuult and the former Regent-General of Floivin Province. His demands are that they be sent forth to face his own selected Champions on the 'Ratog-Gotar', a trial of combat used by the orcs to settle scores in the fairest manner possible. If they refuse the challenge or run, Zuult swears that Sothos Karr will launch an invasion upon the beleaguered, weakened Province that will destroy it long before Imperial support can arrive. Should they fight and win, or fight and die, the Slavemaster will be satisfied and the 'truce', as temporary as it is, will be reinstated in 'good faith'. The PCs decide to take up the challenge, but debate over who to bring along as the seventh champion. Hoary volunteers but is shot down as he is needed to lead the Floivin soldiers, and Baxter says he'll need to be paid a lot of money. They do eventually settle on Mistlethroe, who is prepared more for returning to the Crowslode than for an outright combat, but may have tricks up his sleeves to help. Before marching off to the confrontation, the PCs check local magic supplies for anything that might help them. Gruulsh has the Last Eidolorn store her money, and Badger gives all his to Flake Falloway to hold in the event of his inevitable death, to continue the soldier's dreams of building a brothel. Baro goes to Bishop Conniff to confess to what he did to Brand, polymorphing the whelp into an iguana. Conniff seems surprised that the evoker would lose his cool, but tells him the best way to right this wrong is to find the lizard and change it back. Baro agrees to work on it. Lord Ballyhoo goes to see Swyft one last time, and the tailor is working on something large, armor-like, but will not reveal it through confidentiality. Swyft offers to fight in Ballyhoo's place, and in fact, a large number of city folk seem to think 'they're just orcs' and that the heroes will be back in no time. With a host of Eidolorn soldiers, the PCs march towards the Mimresh. They arrive to see that the 7 on 7 duel will be fought in a 250' x 250' grid, surrounded on all sides by alternating witness of both forces. Ignoring various insults slung at him, the old priest Zuult, who is here in person to oversee the combat, explains the rules. Combat is to the death or surrender, in which case the losers who survive are taken into slavery (or servitude, should the orcs lose). Though the Mimresh itself is armed with readied catapults and ballistas, the orcs are not to intervene, nor are the Eidolorn soldiers present. If the PCs run: WAR. If there are any false Champions among them (which several orc officers confirm there aren't): WAR. If any of the orc witness around the battle square are harmed: WAR. Both teams will cast bone dice to determine first placement in the arena, and this is critical to how the combat will flow. Once they are placed, and the orc Champions have arrived, the PCs realize this will not be an easy fight to just group up and make area attacks, since there are other strategic decisions right from the start. The frantic battle begins, with the enemy cleric, Aarshlut launching a major strike against Badger almost immediately with a harm spell. Gruulsh squares off against Dagam-Burz, a barbarian, in the center of the grid, while several other clumps of PCs attempt to group up for defensive purposes. Unfortunately, this leaves one corner of the battle field open, where the orc warlock Sharku and sorcerer Oghash begin hurtling spells at the players. Although heavily damaged, the orc cleric took down Badger in the following round, and the fight grew more desperate. Flailin Mary', an enemy warrior and trainer of some repute, was left useless in the opening rounds when Ballyhoo fled from her, but she began crossing over to where Solveig was dealing with the slipper orc rogue Kraibag of th Cold Crows. Graygear found some difficulty getting into position to deliver his most lethal attacks, but his innate Spell Resistance protected him from a lot of the magical attacks slung his way. The enemy's dragon shaman Shadaauk made a rush to deal with Baro, and the evoker was constantly being harried by the warlock's eldritch blasts which also imparted blindness upon him. Nonetheless, he threw a cyclonic blast at the dragon shaman and was able to put up a minor globe of invulnerability on himself, the bard, and the deep gnome. Aarshlut 'Dawn-Killer' (orc female): An attractive priestess of Gruumsh, she represented the Slaughtertree clan of Sothos Karr at the trial before the gates of the Mimresh. She fought with a spear and shield and deadly magics which slew both Lt. Badger and Baro Helliger. Private Barry (human male): One of the privates sent to fetch Lt. Badger from Hobfast, took a bribe from said superior officer and basically became 'his man'. Dagam-Burz 'The Belly' (orc male): A white-haired barbarian representing the Dreadfoot clan of Sothos Karr, adorned in silver skulls, hide armor and wielding a brutal greataxe. He was the only orc Champion to fall, slain by Gruulsh in a taxing melee. Flailin' Mary (orc female): A famed Champion and combat trainer of Sothos Karr, who represented the Ironbole clan in the trial at Mimresh. Was unable to bring any foes down, much to her dismay, but dig quite a lot of damage to Solveig in her bear form. Wields the great flail weapon of her namesake. Oghash (orc male): An orc sorcerer representing the Grays of Sothos Karr, had a particular bone to pick with the PCs since several Grays were slain trying to deal with the exposed Syriux during the flight from the pits of Badash. Has a quasit familiar. Slew Gruulsh with scorching rays. Sadaauk 'The Bleeder' (orc male): A dragon shaman who represented the Shatterfang clan at the trial before the Mimresh. Had red dragon totems and could breathe fire, while wielding a terrible longspear. Sharku 'The Ancient' (orc male): A warlock of the Kneebreaker clan, played a pivotal role in the trial by the Mimresh by harassing PCs with his eldritch blasts, many of which were imbued with invocations that could bounce them to additional targets and temporarily blind their victims. Here is the link to the transcript for session #3. We're now using the Roll20 web browser gaming interface, so I've cut and pasted this to a Word .doc for the time being. Rather than return immediately to the Crowslode, the PCs decide they'll spend a minimal amount of time recuperating in Floivin Keep. Graygear, unfamiliar with the surface civilization, decides to scope out the urban setting, remaining hidden; while Lord Ballyhoo misses his audience, and goes to the Seven Floods Inn to play for them. The rest sell more of the haul they've made over the previous few months, and decide to clear out their adventurers' vault as much as possible. A decision is made to pass off the manual of Abyssal rifts to the Arkana Arkiva, for safekeeping, rather than sell it off to Teven, which would have netted a profit large enough to finish paying off Ettenhead...but at what cost, if the nefarious and potent mage decided to USE it? Gruulsh and Baro seek out Monch and the bugling's daughter Shari at the dwarves' manor, to find that she continues to grow, and her host's fascinating with her has not only unsettled his own wife, but grown to the point that Monch no longer wishes to continue the expedition into the Crowslode that he was so excited about...Baro pays the affluent dwarf around $12,000 of his treasure share towards the Ettenhead debt. Meanwhile, Solveig, having little use for her newfound wealth, decides to shower some of it upon the local soldiery, most of which immediately head to the most expensive drinking hole they can find: the Seven Floods Inn. She is accosted by Hoary, who thanks her but deems it more appropriate to put most of her donations into the Last Eidolorn coffers to benefit everyone. But he spares them all a handful of coins. Badger heads off to the Fiery Rat tavern, where he comes up with a business proposition for Flake Falloway, offering not only to expand the tavern itself, but to invest 6,000 gold in a brothel. He justifies it as a chance to 'give back' to the community, in particular the Last Eidolorn. Seeing the potential profits of such a venture, Falloway agrees, provided there are no dwarven women used in the establishment. Badger takes it upon himself to hire 'the girls', but realizes he will need some help, so decides to take a trip locally to the town of Hobfast, hoping the Hosspotches will get involved. Solveig is interrupted a second time this night, by a trio of orcs wielding blades at her, asking all manner of questions upon the fortifications and manpower currently within the Keep. She does manage to escape in a bird form, but not before the interlopers can nearly bring her down! She flies off to get help, and inside the city a soldier helps her back to Armory Square. Badger inevitably arrives at Hobfast, and is let in by a crafty guard who profits off the act. He is met by a local merchant known as Harley Hosspotch, who eventually becomes intrigued by the soldier's business proposal, and offers to get involved, hiring guards and servants for the yet unnamed brothel. He then grants Badger complimentary bed and breakfast at The Crimson Harpy. Back in the city, Monch informs Gruulsh that a guaranteed means to return her to non-halfling form might come in the form of a wish spell, which she'd require a high level caster to perform, perhaps even the Regent-General of Toul Tabor himself. She leaves for Armory Square, to find out that Solveig has been attacked, and with several attentive soldiers, rushes West of the Keep. An exhausted and wounded Solveig receives some healing, and then decides to shack up with the persistent Private Jolson for a misery/pity shag, which greatly disturbs everyone nearby. Baro clears out the soldiers from the Seven Floods Inn, sending them scurrying for armaments at the new rumors of an orc attack. Gruulsh is unassailed as he travels the road towards the Mimresh, and she finds no war party on the plains in the Pass, but then discovers that the Last Eidolorn patrol which spies on the orc stronghold has been slaughtered to a man...and horse. She rushes back to inform Hoary and his fellow soldiers, and collect the other PCs, including Ballyhoo and Graygear, before investigating further. Private Jolson (human male): A trapper/furrier who has recently taken up service in the Last Eidolorn guard. Salt-and-pepper, fine beard and a haughty attitude, he takes a fondness for the druid Solveig which results in a torrid love affair, since the middle aged man, when intoxicated, does not seem to mind her sporadic wild shaping amidst the copulation. Here is the link to the transcript for session #2. We're now using the Roll20 web browser gaming interface, so I've cut and pasted this to a Word .doc for the time being. The armor museum is a massive cavern with several exits, and they decide to travel west, when they encounter an odd dead end where two chests, each with three parallel locks of strange sizes, are set into the floor. Baro uses knock on one of the chests, which lifts its lid, but also spawns a massive incendiary cloud which begins to sear the characters until they run out of range. They seem ready to give up, but once Monch discerns a sliding/shifting wall beyond those chests, they come up with an alternate solution: Wendel first jams the chests to disarm the cloud trap, and then both Gutwrench (the new gnome) and Wendel to simultaneously pry open the locks on each side, using Baro as a backup to knock another one if they blunder the timing. Had they but one lockpicker, it might have proven impossible, but as they moved from the outer locks to the smaller, closer devices, it became gradually simpler. After popping the inner locks, the lids flew open and the wall spun, depositing the pair into a grisly looking torture chamber. They managed to figure out how to use the chest lids as levers, and then retrieve the rest of the party before pressing on. They find a feeding shaft which is crammed with viscera, especially brain matter, and Solveig wild shapes into a rat to search through it, finding an unfinished note from a fell halfing explorer, Hal Hosspotch. Moving into the next area, they find a pair of ghastly abominations guarding a stone door engraved with tentacles. They engage, Baro and Mistlethroe wielding deadly magics that almost fully cut down the creatures, but not before a good chunk of the party is mysteriously put to sleep. But the PCs do make short work of the things, which deflate into oozing giant pustules on the cavern floor. Some study of the forms reveals that they are related somehow to illithids...perhaps a more primal version, or 'pets' of the mind flayers. They collect some random treasure littered about the area, and discover that the next chamber contains a glowing, pulsating glass sphere set into a stone shaft, which seems to ebb abjuration magic, the source of the teleporation block located in the Hazard Shafts area of the Crowslode! The rest of the PCs back off, and Badger shatters it, allowing them to now use these magics in this region of the Underdark. After a long rest, interrupted only when Gruulsh-ling hears a group of frustrated bugbears arriving at the dead end where the chests used to be, Mistlethroe and Baro teleport the party successfully back to Floivin Keep. Monch and Gruulsh take the rapidly aging dwarf offspring to Gnarlbottom Manor, and Wendel says his goodbyes, though he does mention he might hang around the Keep for some time. Then the group sells some of their new stash to Teven the Worm, hands out some of the gear, and prepares to return to complete this almost impossible task. After collecting the treasure from the misshapen, hunchbacked giants, some of which is too heavy for them to carry, the PCs head south through the caverns, with Wendel checking for traps all along the way, and a group of them protecting the Gruulsh's unusual dwarf offspring as best they can. Though she can hardly speak yet, she does occasionally bark out simple phrases in dwarven, and seems to have grown at an unbelievable rate, to years overnight. Monch also seems strangely smitten with the child, moreso than he should, and Lord Ballyhoo determines that there is some enchantment effect overtaken the noble. The heroes enter a new area with a pair of giant statue dials depicting a fell dwarven archmage known as Denzeth 'ManyFates' Dourmug, a descendant of the very rogue they have come to track through the Crowslode. Badger shoots an arrow at one for good measure, but then remembers that they had acquired a script in a nearby cavern, with rune-numerals similar to those on the massive dial bases of the statues. 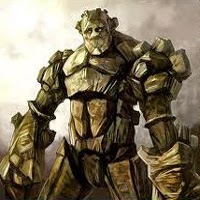 Alas, the medusas have other defenses in place, two more stone golems very similar to the one the PCs dealt with above! The battle is joined in full, with the golems taking the front line and the basilisks slowly creeping forward. Almost the entire party is engaged with the golems, some healing and some trying to do whatever damage they can, when a pair of basilisks get close enough to try and affect them. Fortunately, they all make their saving throws. They are picked off by a combination of magic attacks and arrows, and then Baro throws down black tentacles to slow any other attackers, who are then forced to take another route around. On that route is Wendel, who himself had decided to sneak around and perhaps surprise attack someone, but failed miserable...as the medusas and remaining basilisks come around to flank the party, the rogue flees! By this point the stone golems have finally been chipped away, and thanks to Baro's big gun spell for the day they make pretty quick work of the remaining enemies. This is a reboot of our online Udders Well solo campaign. After retiring Six-Shite, we decided to dive into 5th edition with a fresh 1st level character and test drive the new rules. Though this storyline does exist in the same setting and time as the main Udders Well tabletop campaign, and also contains a lot of the same personalities, the characters from each won't be able to interact directly until I have upgraded everything later in 2015. If Ryan shows up for tabletop games in the meantime he will use an NPC and be credited attendance/XP sessions for this solo run. Here is the link to the transcript for session #1. We're now using the Roll20 web browser gaming interface, so I've cut and pasted this to a Word .doc for the time being. Campaign has ended after five years. You can find links to other campaigns (some of which are set in the same setting), below. This is the campaign blog for Udders Well, a generic 3.5 edition Dungeons & Dragons campaign run by myself to kill some time with friends in Methuen, or online for our one estranged player out in San Francisco. These pages will be used to keep session diaries, as well as post information on the campaign setting. * New classes, General and Metamagic Feats only. ** Shadow Mage class only. Additional options and reference materials will be gradually added to the game. Slain at the taking of Ettenhead. Slain by the Sothos Karr champions outside the Mimresh. Sessions Played: previously 46 (1st/+0)/now: 41 after raise dead was used. Slain by Mulch (for the second time) in Cedarway. Slain by Syriux beneath Slaughtertree Hold. Slain by kuo-toa beneath the Skrath Cairn. Alive, but retired after fleeing Floivin Keep. Killed by 'friendly fire' in the retaking of Tarndim. Slain at the battle of Haunted Horrn. Alive, but retired after Ettenhead. Alive, defected from Last Eidolorn.